Courtesy of Jesse’s Café Américain. The US Stock Market Crash of 2007 – 2010 expressed in percent decline from the market top in October 2007. 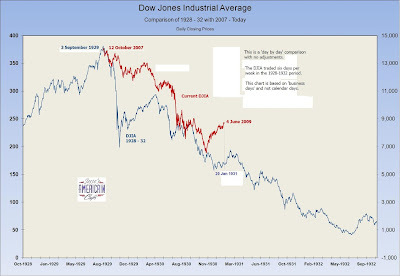 A trading day by trading day comparison of the Great Crash of 1929 – 1932 with the current market decline from its October 2007 top. The classic profile of a collapsing bubble. The economic policy of the early post-Crash period was heavily influenced by what was later called Liquidationism epitomized by prevailing views of the Hoover Administration. The idea was that allowing companies and banks to fail as quickly as possible, in a relatively uncontrolled manner, was the appropriate response. This view is still held by the Austrian School of economics. 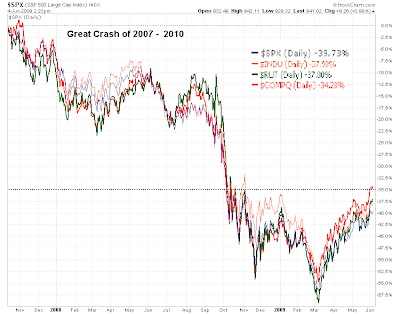 The flaw in this theory would seem to be that the decline of a crash is not like a natural decline in a business cycle or a severe demand contraction, but the result of a precipitous collapse from a Ponzi-like monetary and credit expansion. One can argue this point, endlessly if they wish to ignore history and economic reality, but again we need to remember that the outcome in several other nations embracing this theory was the rise of militant, fascist political regimes in response to societal dislocations. Obviously the best cure is prevention, in not allowing monetary bubbles in the first place. Duh. But one has to play with the cards in one’s hand, and not the hand they wish to have. But there is a lesson in this for our current ‘cure’ in that blowing yet another asset bubble from a monetary expansion, and little else, will not work. We ought to have learned this from the Fed’s policy responses in 2003-2006 which led to the US housing bubble. Systemic reform and rebalancing is absolutely essential to a sustained economy recovery, and needs to be measured by an increasing median wage and a reversion to manageable income – debt ratios. The headwinds against this remedy from an outsized financial sector that in many cases has coopted the political process makes a sustained economic recovery less probable without a significant shock to the political and economic structures of the US at least.